Cooking with wine can pose a challenge. Mostly of the "I-hope-TheHusband-doesn't-drink-everything-before-I-can-use-it" variety. Kidding. He's not that bad. He usually leaves me a few drops at least. I'll be the first to admit that I'm no wine expert, but I do know what tastes good and wine certainly has a way with food, don't you agree? It is usually added to stews and other long-cooking dishes, giving the wine a chance to hang out and mellow a little bit, but I figured, why hide a good thing? 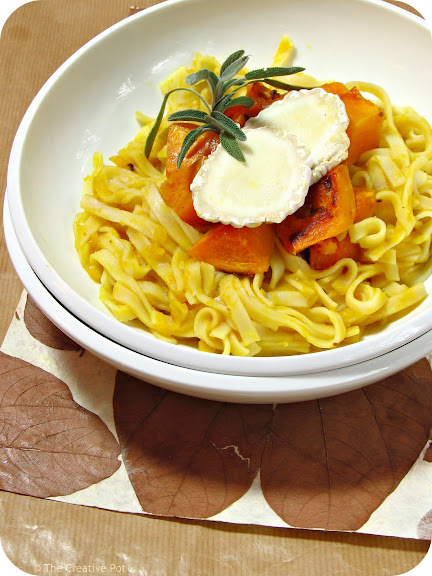 So this pasta dish features those autumn/winter classics, butternut and sage, partnered with a fruity, clean-tasting chenin blanc. Oh and some goat's cheese. You know I can't resist the cheesy stuff. Just a note though - you are using good wine to cook with right? Right?? Yeah, of course you are. But just in case any of your friends still use any old plonk to cook with, remind them of the cardinal rule: if it ain't good enough to drink, it aint' good enough to cook with. PS: If you'd like to read more about my (and my fellow Kleine Zalze ambassadors) wine adventures, hop on over to For The Love of Wine. We'll be battling it out for the grand prize of a weekend away over the next few weeks. Hold thumbs that I win, mmmkay? 1. Arrange butternut, onion and garlic on a baking tray. Drizzle with olive oil and bake at 180C (350F) for 10 - 15 minutes or until cooked through. 2. Spoon onions and half of the butternut (reserve remainder) into a blender, along with 1/4 cup of the chicken stock. Process to a fine puree and transfer to a saucepan. Add the rest of the water, along with the wine, nutmeg and salt to taste. Bring to a boil, then lower heat and allow to simmer for 10 - 15 minutes or until reduced. 3. Meanwhile, cook pasta in a pot of boiling water until al dente. 4. Drain pasta, reserving some of the cooking liquid, then toss with butternut sauce, as well as reserved butternut. Stir cheese, butter and sage through, allowing cheese and butter to melt before serving. Add reserved pasta cooking liquid if necessary, to loosen, before serving. Mmmmm, that second picture says Bite me......love goat's cheese melting into pasta!!! I've made something similar to these before and oh wow is it GOOD. 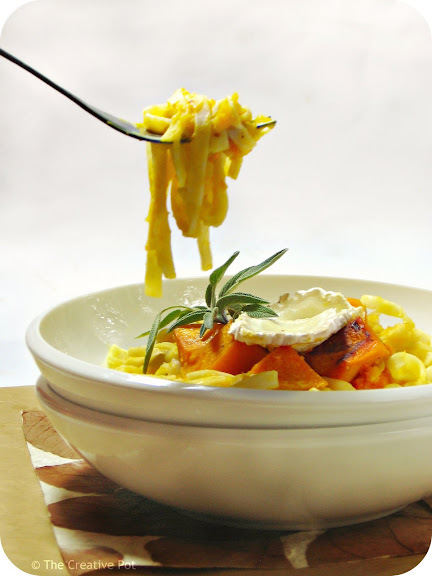 Butternut squash and pasta never fail me. And neither does good wine. Mmmm.. this will be making its way to my table shortly, you can't beat pasta for winter comfort food! Yumm yummy yum! Combining all my favourites! Can't wait to try it. Looks delicious. I'd pair it with a Chenin that has a bit more oomph than the Kleine Zalze - perhaps a De Morgenzon or Jean Daneel Chenin Blanc. Both has more rounded palates and are fuller and richer than the KZ. Should work beautifully. Joanne - Too true, if you have butternut or pasta you're good to go. Polkadotcupcake - For sure! I tend to be a lot more carb-loving during winter as well. Claudine - Let me know how it works out! That look pretty delicious and quite tempting marisa!